Dropped your cell phone in water? Solved! Your worst nightmare is now a reality. You dropped your phone in the toilet, sink, bath, hot tub or pool. It’s something we all dread, but happens to the best of us. We’ve compiled some best steps when you’re in this situation that could possibly save your phone. 1. Get your phone away from water! ASAP! 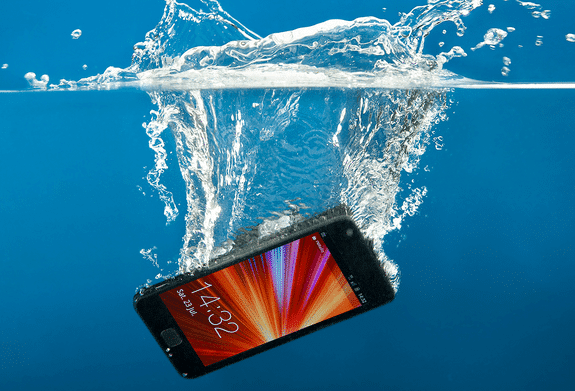 This may be obvious – but it deserves to be noted that the faster you remove your phone from water, the less possible damage that water can do. Act fast! To avoid a short circuit turn your phone off as soon as possible. Keep it off until its had time to dry (see step 4). Disassembling these vital parts will not only ensure they dry quicker – but also help the overall phone dry faster. Find the nearest paper towel, or cloth and try to dap the phone anywhere you notice water. Tilt the phone from side to side and up and down to get as much water out as possible while dabbing with your chosen cloth. The goal here is to get as much water out of the phone as soon as possible. Do not blow into the phone, this will cause water to find itself even deeper in your phone. Do not try to microwave your phone – or heat it up in anyway – not even with a blow dryer. Heat in general is bad. What will work much better after there is no visible water on the phone, is to let it air dry. Disassemble the phone (where possible) as outlined in step 3. You may have heard talk of putting your phone in rice. While this is fabled to work it doesn’t do much at all for your phone – the key is to get all the water out and to let it air dry – sure you can do that in rice – but rice has not been shown to speed up any of the drying process. After you’ve dried the phone out, we recommend letting the phone sit still for a least a couple of days. Hard to imagine not being with your phone that long – but letting it sit till completely dry will ensure your phone does not short circuit when you turn it on. If everything goes well your phone is now perfectly dry and ready to be turned on. but if all else fails give us a call and we’ll get you sorted out. Putting the phone in a long gym sock and spinning it in the sock will use g-forces or centripetal force to make the water come out of the phone. Spinning it for at least 5 minutes, repositioning by a 1/4 turn it in the sock, spin for about 5 more minutes – repeat for a total for 4 times, 5 minutes *each* time. You don’t have to spin it super hard. Just a good effort continuously for the duration of each turn. Make sure you have a good grip on the sock, otherwise you might have a broken phone to boot when it flies out of your hand. Having someone else who isn’t clumsy for assistance can share the load of how physically demanding this might be to some. Be sure you do this in an open area, so that the phone in the sock doesn’t slam or bash up against something or someone. Then let it sit in the sun. Where there is a good breeze to help dry and not let it ‘cook’ too much in the sun. For at least a day, then try to power it up. I’ve personally done this for 2 phones and it worked like a charm. Anthony Torre on Dropped your cell phone in water? Solved!